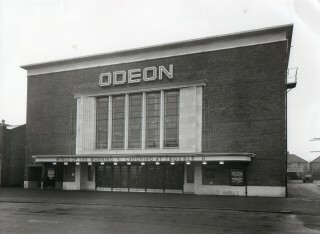 Odeon Cinema on St Albans Road, North Watford. Watford has a large amount of activities that you can choose for your leisure time. Watford had a good selection of Dancing Schools, Star, Oakley, Peggy Shilling, that you could use, to prepare you for the Saturday Dances at ‘The Town Hall’, at one time very popular, and was always so crowded, that you were not allowed to jive, strictly ‘Ballroom’. Girls and boys would congregate in separate groups, and when an easy dance like a waltz was announced, there would be a stampede towards the girls for a partner. If you were able to Foxtrot, Quickstep, or do Latin American, you had a better chance of getting a partner. Boys always outnumbered girls most Saturdays (ladies – excuse me!). It could be nail biting, as you always hoped that you had caught the eye of someone who liked you. The ‘Town Hall’ was also popular for concerts, Boxing, and wrestling. The Hall is now called the ‘Watford Colosseum’. We had a good selection of cinemas. The two Odeons would alternate the showing of films, a film shown in Watford Parade would be shown the following week at the North Watford Odeon – always great if you missed a good film, as you could catch up the following week at North Watford. There was also the Gaumont, Carlton, Empire, Regal and the Plaza. When ‘Big Bands’ became popular, the Gaumont was used for Sunday ‘Big Band’ concerts with bands like Ted Heath, Ken Mackintosh, Eric Delaney, Johnny Dankworth & Cleo Laine, and Jack Parnell, always sellouts as they were very popular. For Traditional Jazz followers there was the ‘Watford Jazz Club’ which was held at the Ex Service Mens Club. Visiting Jazz Bands wereTerry Lightfoot, Chris Barber, Ken Colyer, Steve Lane & his Southern Stompers, Acker Bilk, Mike Daniels & his Delta Jazzmen. Steve Lane’s band was resident at Rickmansworth Jazz Club. Watford has also been very lucky to have its own ‘Palace Theatre’ which we all hope will continue to be well supported. To-day we have new modern clubs like ‘Oceana’ etc., who provide entertainment for a new generation. Whereas we had to plan our leisure to meet last trains or buses, which terminated after midnight, the new generation are, however, are just arriving for their entertainment, knowing there will be taxis, late transport, probably Mum & Dad on late call. This page was added on 12/12/2013. yes, the cinemas. The Gaumont, wonderful art deco,whilst the Odeon all glit and splendour. The Carlton that used to be a ice skating rink, so that when you sat up stairs, you had to to turn your head to the right to view the screen. The Empire, I always recall the large ferns in the foyer.